The Joseph Banks Retirement Village Community Centre officially opened the centre, complete with craft and meeting rooms, gym, spas, pool, saunas, theatre room, library and bar on May 2. The residents’ committee will control the centre’s operations, and members are now organising timetabling, social activities and events. ‘Our social co-ordinator is going a hundred miles an hour,’ said committee chairwoman Hilary Passamani. When complete, the village will have 78 units, so many people will be able to take advantage of the two-storey centre, built by advocacy organisation Retirees WA. Committee secretary Jim Marlow said building a sense of community for residents had been slow going until now, but the village was gathering speed and he thought the centre would help develop closer ties. 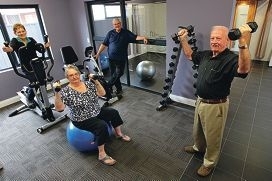 ‘This opens up a whole new world for retirees,’ he said. Vice-chairman Cliff Raynor said residents of the estate had always had to use a street-party format for any kind of social gathering and he looked forward to having a wider range of options.